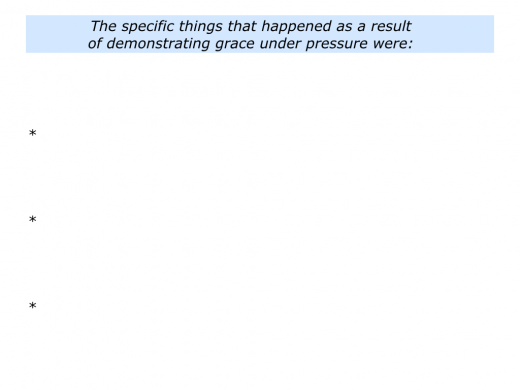 When have you shown grace under pressure? You may have shown it when receiving bad news, being targeted with a personal attack, facing a difficult challenge or whatever. What did you do right to demonstrate this quality? You may have taken a deep breath, bought time to think and seen things in perspective. You may then have been kind, generous, done your best or behaved in another way. Different people show grace under pressure in different ways. They may do this in the midst of a crisis, when playing a sport, making tough decisions or whatever. Ernest Hemingway is cited as the first person using this phrase in a public arena. 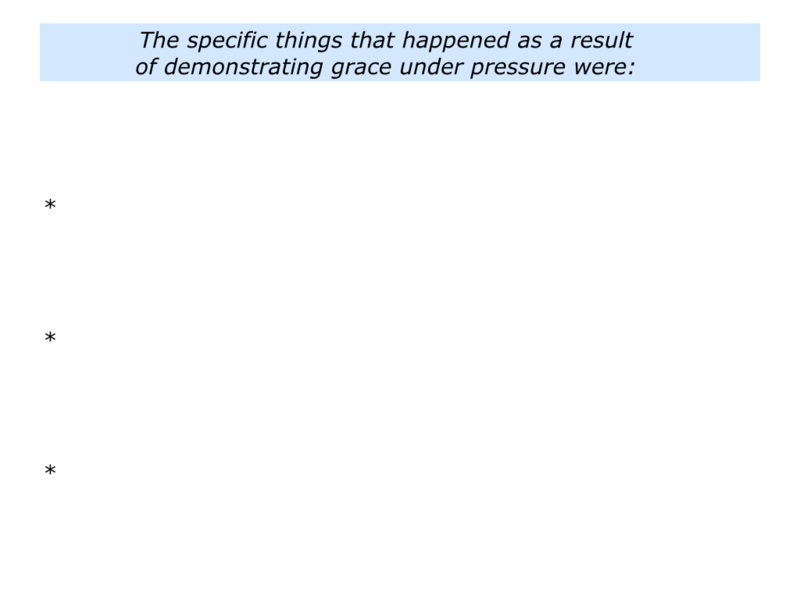 Responding to a question from Dorothy Parker about what he saw as guts, he described people who showed ‘grace under pressure’ when faced by difficult challenges. People demonstrated their true character is such situations. 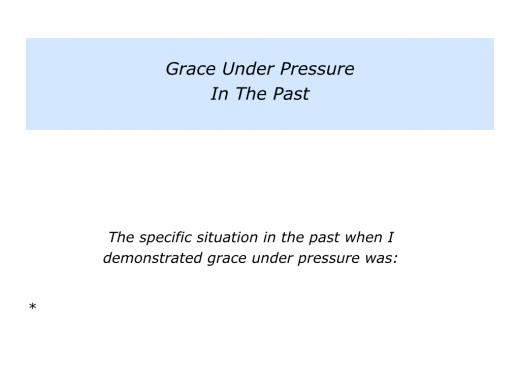 Describe a specific situation in the past when you demonstrated grace under pressure. Describe the specific things you did then to demonstrate this quality. There are various models for staying calm during crises. Christopher Bergland, for example, described how to achieve this state by focusing on your vagus nerve. Published in Psychology Today, his article is called The Neurobiology of Grace Under Pressure. It is subtitled 8 habits that stimulate your vagus nerve and keep you calm, cool, and collected. You can discover more via the following link. 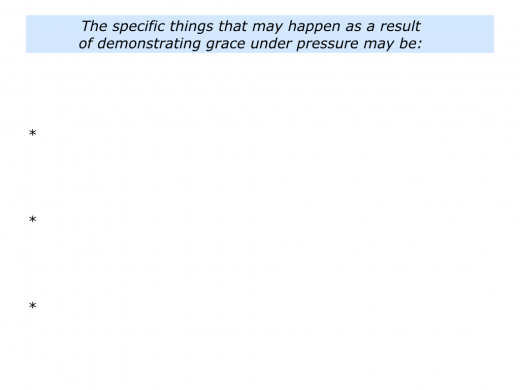 Marjorie Clifton has written a fine article called Grace Under Pressure: Why difficult situations speak the most about you. She begins it with the following statement. 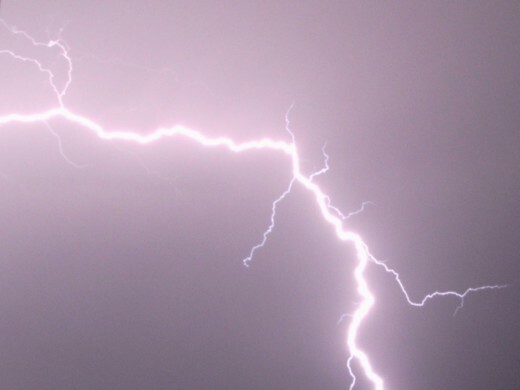 One leader I worked with used his company’s values as a compass for staying calm during a crisis. The company had hit unexpected trouble that had profound implications for the business. People had devoted considerable time to crafting the values, so he explained his approach in the following way. Gathering people together, he urged them to use the values as their guiding principles. Starting from this base, people found creative solutions to the challenges. Despite the problems involved, they focused on the job in hand. People chose to be disciplined, rather than to succumb to drama. They combined their talents to implement strategies that helped the company to build a successful future. 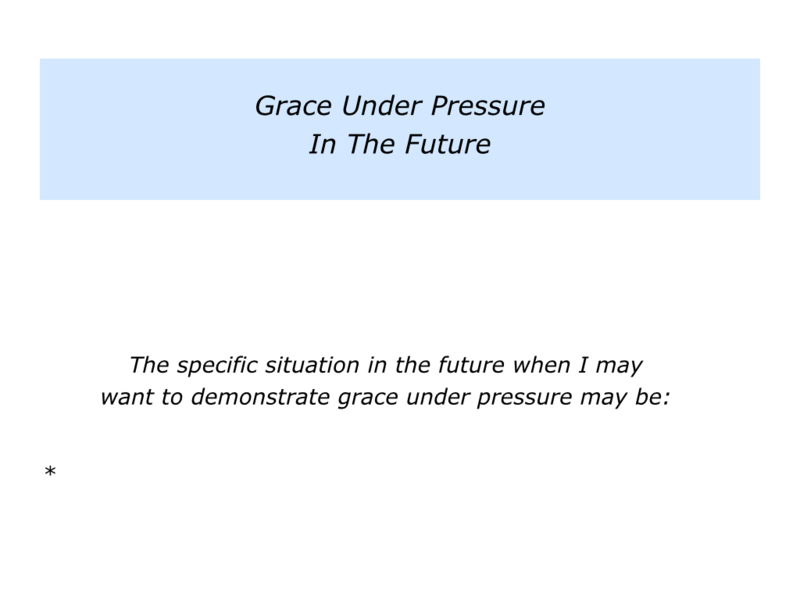 Looking to the future, can you think of a situation when you may want to demonstrate grace under pressure? You may be facing a crisis, an ethical dilemma or a potentially traumatic event. How do you want to deal with the situation? 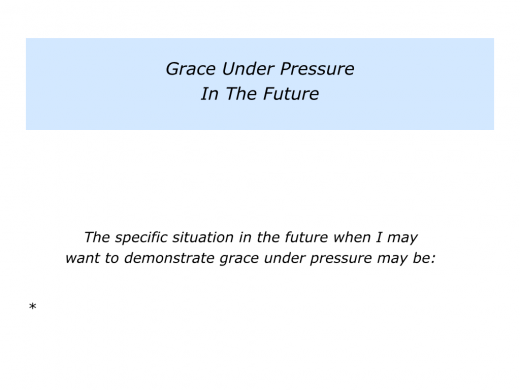 Describe a specific situation in the future when you may want to demonstrate grace under pressure. Describe the specific things you can do then to demonstrate this quality.